Give a listen to the SR10 — you'll be gobsmacked! For over forty years, Cambridge Audio has been winning awards with their British designed separate tuners and amplifiers. 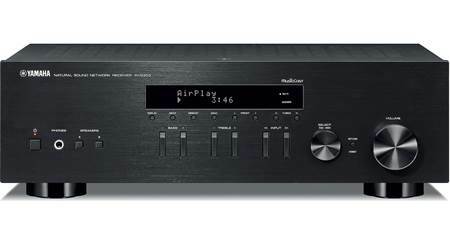 The SR10 brings together these world-class components for an astonishing result — a home stereo receiver that combines remarkable performance, simple operation and a rather modest price tag. The SR10 delivers a conservatively rated 85 watts per channel that sounds like significantly more. Credit the rock-steady toroidal transformer — it will keep your speakers belting out a top-notch sound at any volume level you fancy. Use the SR10's two pairs of speaker outputs to drive a second pair, or even to bi-wire compatible speakers for peak performance. And here's an example of how Cambridge looks at every detail of construction: The SR10's metal case employs robust acoustic damping to reduce distortion even further. This latest version of the SR10 comes equipped with an output for a powered subwoofer and four inputs for other components in your system. We recommend starting with the companion Cambridge Audio Topaz CD10 disc player, for smashing sound quality from your CD collection. Connect your turntable and throw on some vinyl for more sonic delight. 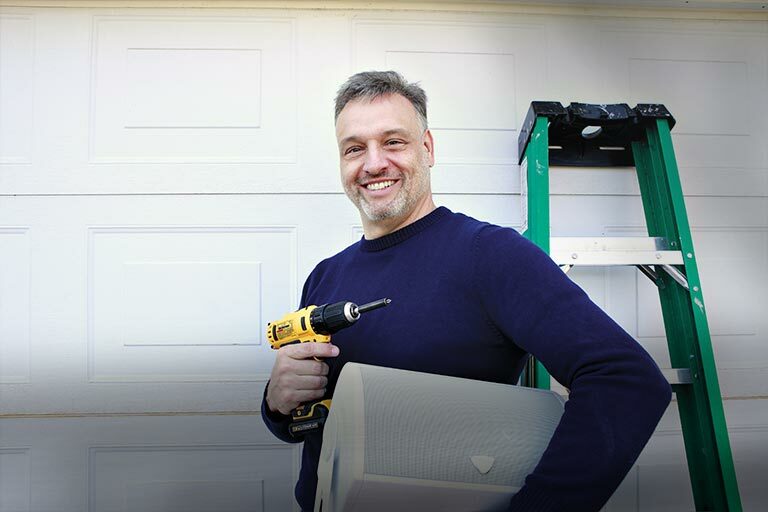 With both in and out jacks for a recorder, you can hook up your tape deck, too. 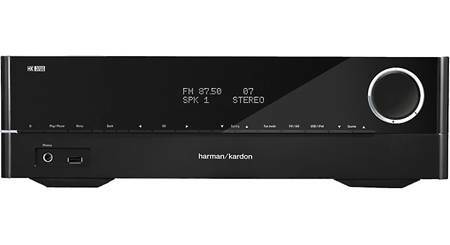 You'll also find that the remarkably sensitive AM/FM tuner will lock in the stations you love. The SR10 also has a minijack input on the front panel of the receiver to easily accommodate your portable player. Finally, there's a 1/4" headphone jack for discreet listening. This unit made me realize that my previous receiver was under powered. My JBL 4313s never sounded so good. The sleek, all-black design is nice, but I would go for a glowing tube or two - just for the ambiance. Stereo Amplifier: The Cambridge Audio SR10 stereo receiver employs a fully-discrete, high-power, bipolar-transistor based, power amplifier rated at 85 watts RMS x 2-channels. The amplifier can handle impedances between 4 and 8 ohms. A/B Speakers: The Cambridge Audio SR10 is equipped with A & B speaker terminals to connect two pair of loudspeakers or bi-wire a single pair of loudspeakers. You can select which speaker outputs are heard - A speaker only, B speaker only, A+B speaker, or Off. The amplifier can support a 4-ohm load when driving only one pair of speakers. The amplifier can support an 8-ohm load when driving two pair of speakers. Rugged Chassis Design: The Cambridge Audio SR10 stereo receiver has been carefully designed with a brushed aluminum front-panel, rigid metal chassis, and internal bracing to prevent resonance and improve sound quality. Toroidal Transformer: The Cambridge Audio SR10 stereo receiver utilizes a custom low-flux toroidal transformer for audiophile performance. Cooling Fan: The Cambridge Audio SR10 features a very quiet speed-controlled cooling fan to keep the receiver operating at a normal temperature for consistent performance and outstanding reliability. 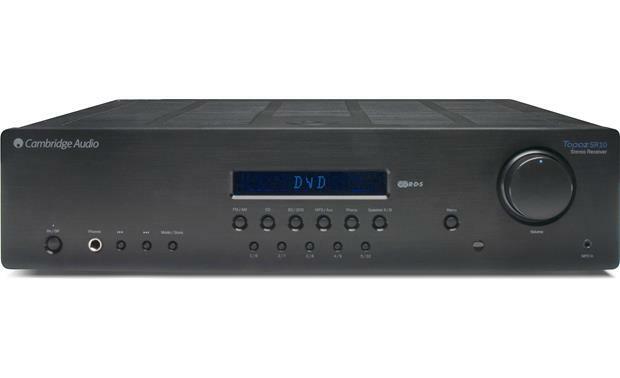 AM/FM Tuner: The Cambridge Audio SR10 stereo receiver features a built-in AM/FM with manual, seek, and preset tuning. RDS: The built-in AM/FM tuner features RDS for station name display on FM stations that support this function. Preset Tuning: You can store up to 30 AM/FM station presets (15 each). Mono Mode: For low quality stereo FM signals, selecting the Mono mode can reduce the noise and improve reception. LCD: The Cambridge Audio SR10 stereo receiver features a front-panel LCD for the display of information, such as the selected input source, station identification, volume, and tone/balance level. Volume Control: The Cambridge Audio SR10 features a front-panel rotary dial to increase or decrease the level (-80 to 0) of the sound from the speakers outputs and headphone output of the unit. You can also use the included remote control to adjust the volume level. Tone Control: The Cambridge Audio SR10 offers Bass (100Hz) and Treble (20kHz) controls which are adjustable from -10 to +10dB. The unit also allows you to balance the unit's speaker outputs left-to-right (+/-10). 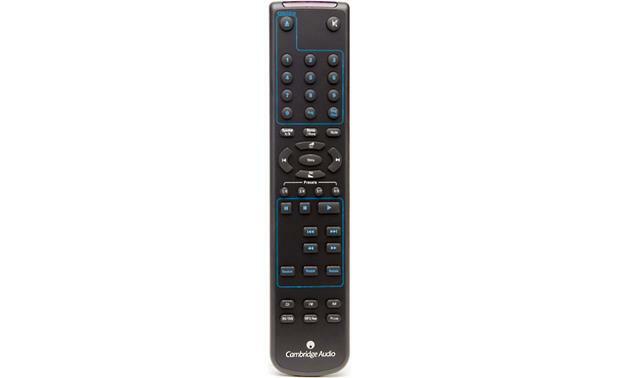 Remote Control: The Cambridge Audio SR10 comes supplied with an IR remote control for wireless operation (Menu/Source/Volume) of the stereo receiver. The included remote control will also operate playback function of the Cambridge Audio CD10 CD player (779CD10, sold separately). 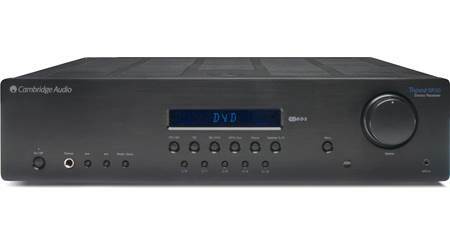 4 Rear-Panel Inputs: The Cambridge Audio SR10 stereo receiver is equipped with 5 rear-panel analog stereo RCA inputs (MP3/Aux, CD, Phono, BD/DVD). These analog stereo RCA terminals are suited for any line-level source. 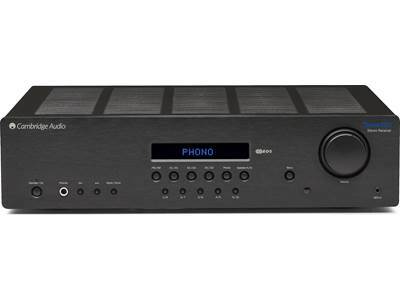 Front-Panel Input: The Cambridge Audio SR10 stereo receiver features a front-panel 3.5mm auxiliary input for temporary connection of a portable digital audio player. Record Output: The stereo receiver's analog stereo RCA record output lets you connect a tape recorder or CD-burner. The unit's record output is not affected by the volume control or tone adjustments. Subwoofer Output: A single rear-panel RCA subwoofer output is used to connect a powered subwoofer. Binding Posts: The Cambridge Audio stereo receiver is equipped with 8 binding-post speaker terminals to connect two pair of bookshelf or floor-standing loudspeakers. The binding-post terminals will accept bare wire, pin-connectors, and banana plugs (single/dual). The binding post terminals are color-coded (red/black) to distinguish positive and negative. Headphone Output: The Cambridge Audio SR10 stereo receiver is equipped with a front-panel 1/4" headphone socket for connection of a set of headphones. The amplifier's speaker outputs are muted when headphones are connected. 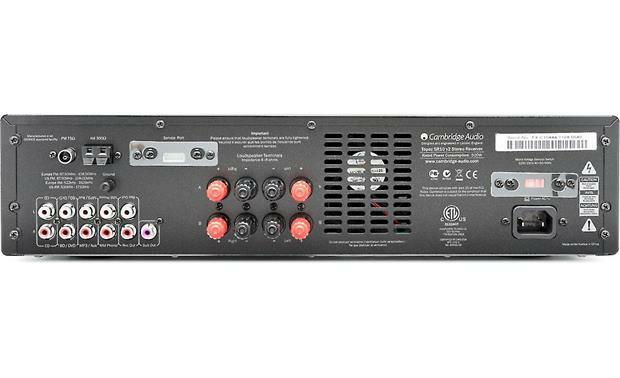 Detachable IEC Power Cord: The Cambridge Audio SR10 stereo receiver includes a detachable 5' IEC power cord. 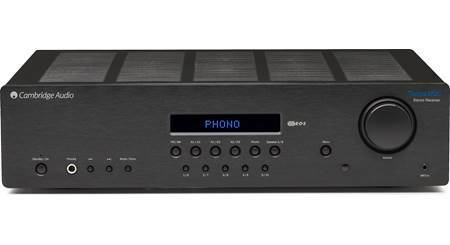 I would like to connect my amp to a DAC component to be able to use blue tooth but which one should I buy? I forwarded your question to an Advisor and they responded with the following: We'd love to help you select the best possible components for your setup. For this we'll want you to contact one of our advisors directly by phone (1-800-324-9695) or online chat. Is it necessary to connect a powered sub woofer or can the unit function with satisfactory bass without it? Searches related to the Cambridge Audio Topaz SR10 Stereo receiver.